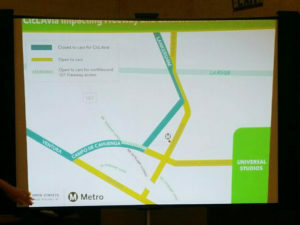 Two CicLAvia Meetings in One Night! If you can’t get enough of CicLAvia, you can be like me and double up on the same night. Separated by less than three miles, there is going to be another Community Meeting> at the North Hollywood Library at 6:30pm and a presentation taking place at the Studio City Neighborhood Council that starts at 7:00pm. Mr. CiclaValley is torn between the two, so much so that I’m going to try to make both. How? That remains to be seen, but seeing how some businesses are trepidatious about the event. I’ll take the pulse at the first meeting and jet to the second. The Community Meeting will be similar to the previous one at Beeman Park, but promises to increase in size. The SCNC meeting will have many concerned stakeholders, but most will learn about CicLAvia for the first time. What to do?